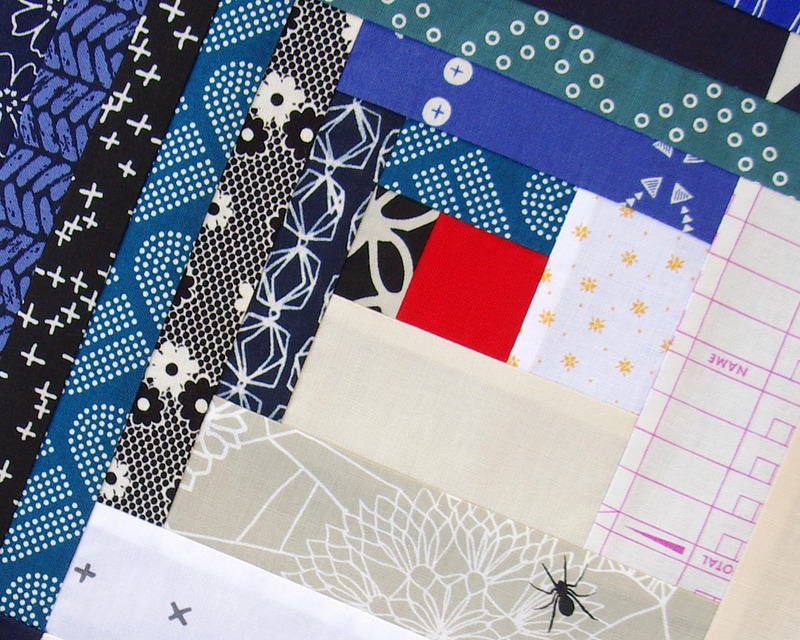 This week I cut into my bundle of Bluebird fabric, a collaborative collection by the Cotton + Steel designers. The Bluebird collection was inspired by a group of vintage Japanese fabrics that had aged and naturally discolored over a period of time. Similarly, several of the prints included in the Bluebird collection have been intentionally aged with watermarks and discolored to add richness and depth to the fabrics and the items made with them. 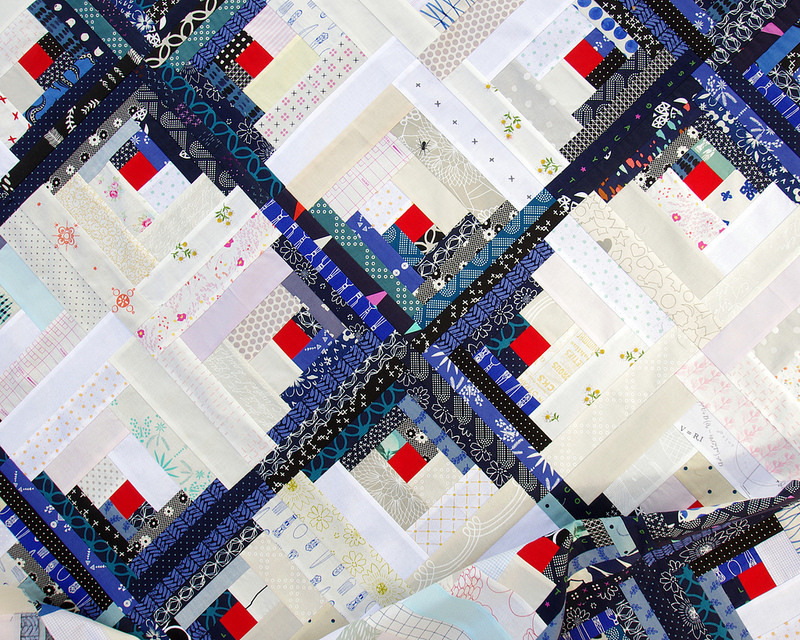 In keeping with the vintage and antique vibe of this collection I wanted this quilt to be a very traditional quilt. 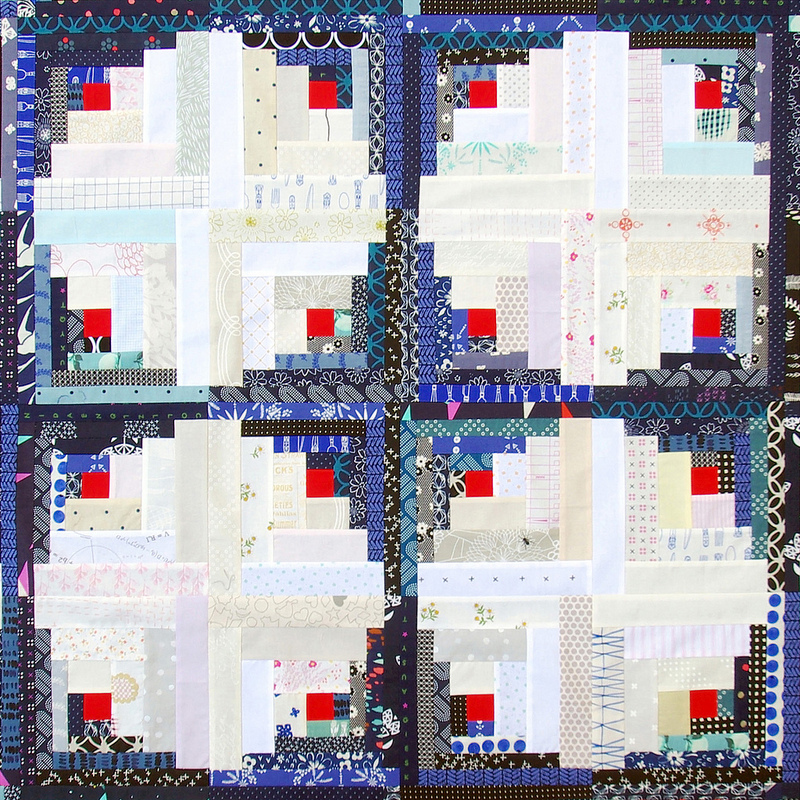 And it doesn't really get much more traditional than a Log Cabin Quilt with red center squares. I played with several different size log cabin blocks before settling on a curvy log cabin block to create an illusion of curves by varying the width of the light and dark logs. In this case I have cut the light color logs so that the finished size is twice the width of the finished size of the indigo logs (the finished width of the light color logs is 1.5" and the finished width of the indigo logs is 3/4"). more Cotton + Steel prints. Quilt top measures 53 inches x 53 inches. Beautiful selection of fabrics for this stunning log cabin! It's looking great. Still, probably not the right quilt for anyone with arachnophobia! Another beauty! 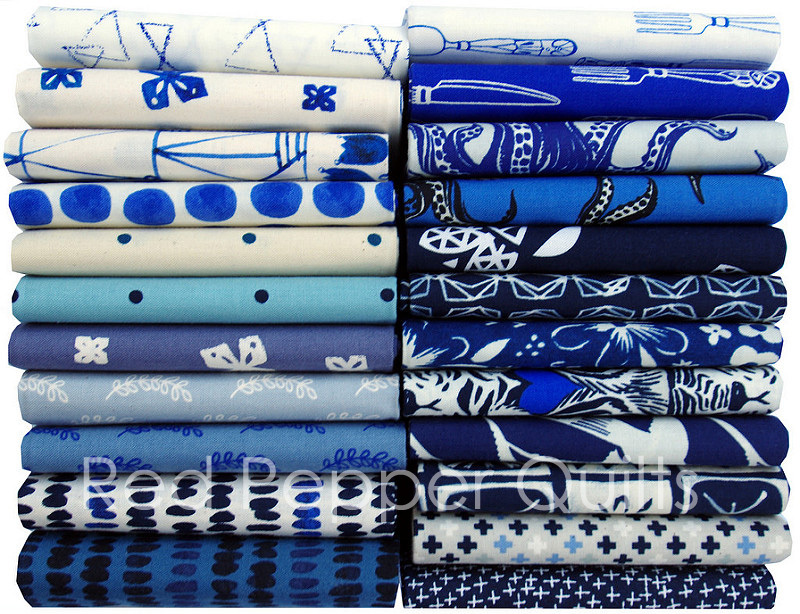 I love the skinny blues and wider low volumes - so interesting. I didn't realize that would work - thank you, I think I'll try it. I do love the spider! 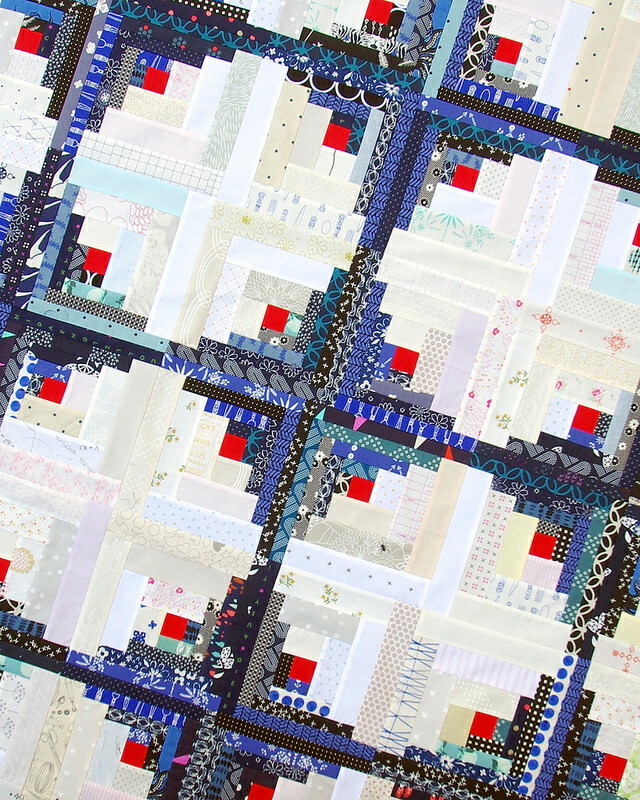 I really like the fabric and the way you used the blues for the thinner strips. Really beautiful. This is pretty fabric and you have chosen a great design to showcase it. The spider does add a lot of interest. 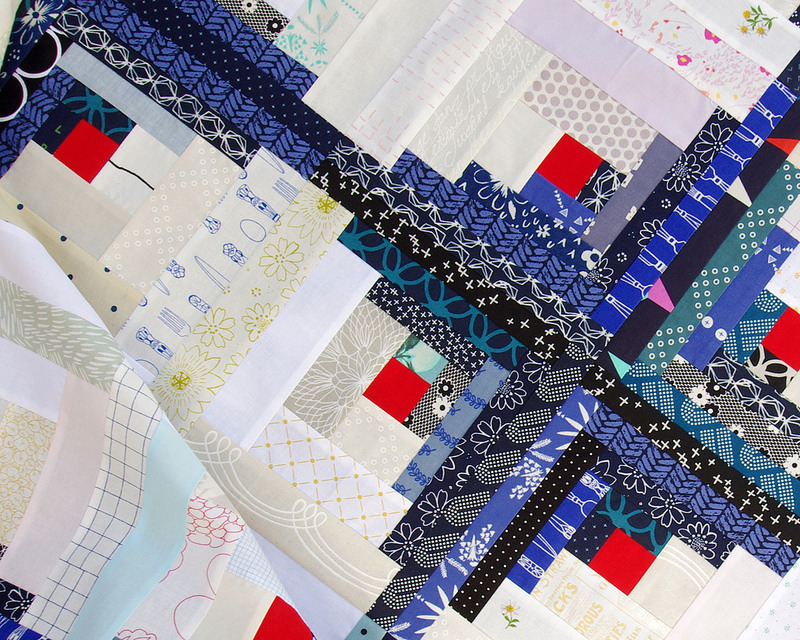 What a wonderful collection of fabrics you've used in this quilt, Rita. They really make the quilt sing. Also a great quilt block. Love the log cabin, it's so versatile. 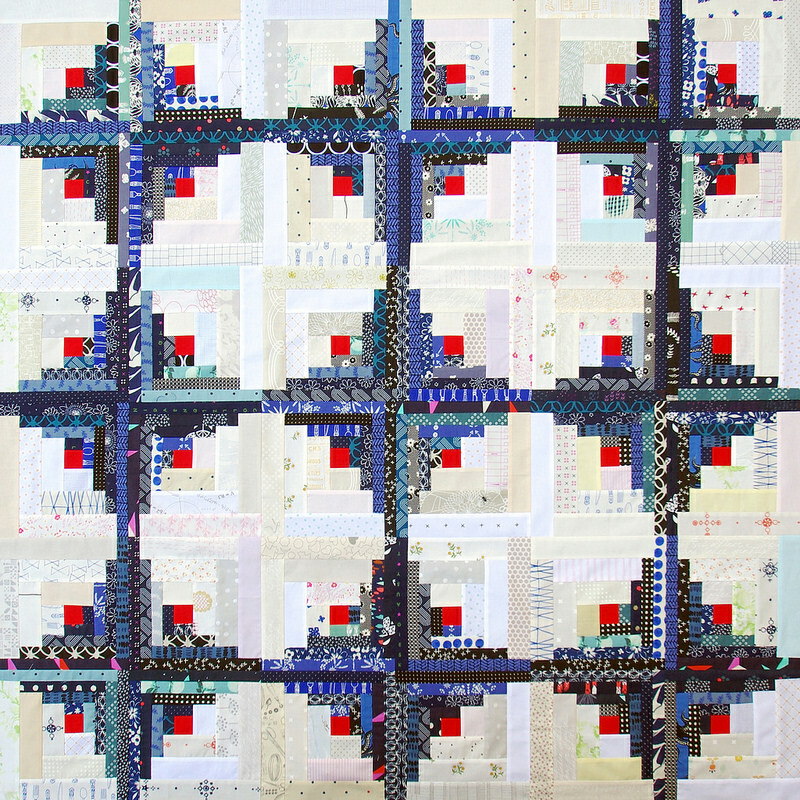 I think this is my favorite of your quilts, Rita! Love the final layout you chose--and the colors are gorgeous! Stunning! I have this collection and haven't been able to decide what to do with it. Love your log cabin blocks! I hate the spider! I cut them out of my Spellbound fabric and got rid of them because every time I saw it I got the hee bee gee bees! So I've got a fat quarter with holes since I knew I'd never put them in anything, EVER. Strangely the silver spider doesn't bother me as much. 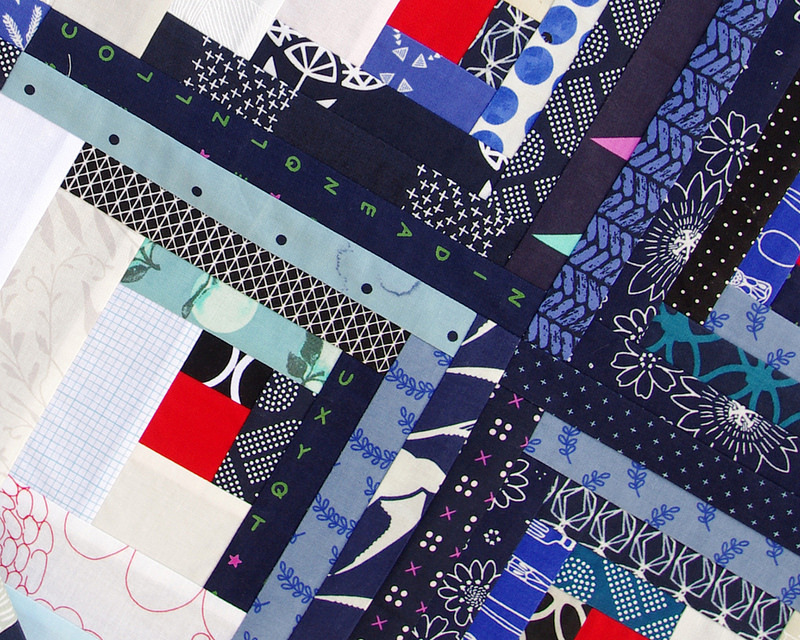 Pretty quilt... Sans spider! I love this, Rita! 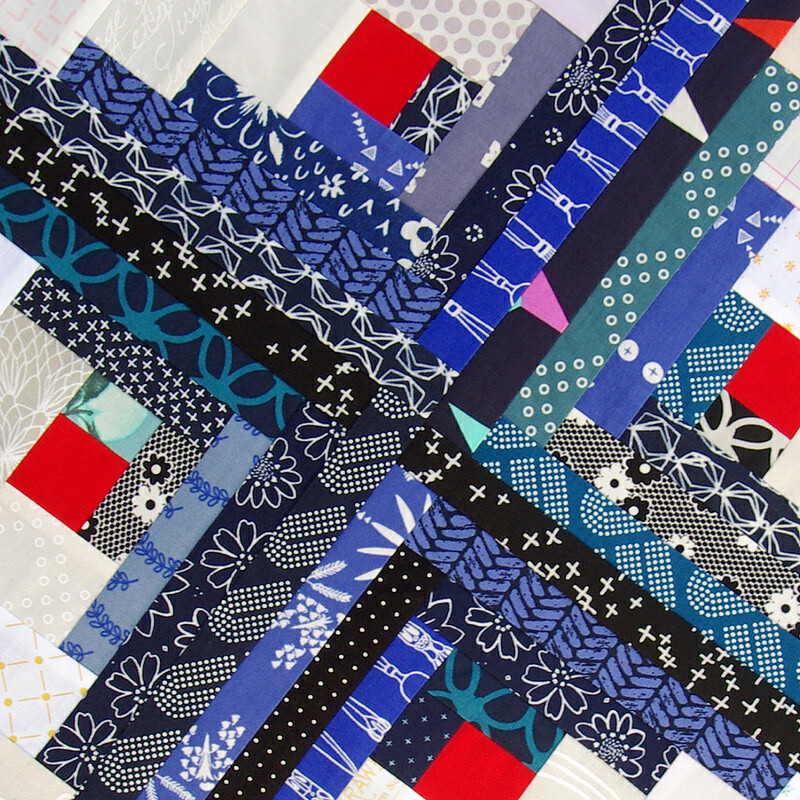 I think there is something about the bluebird line that just lends itself to traditional patterns - I used it for my Ohio Star quilt in January. Rita, this quilt is really stunning.... and classy. I love the layout of the blocks. I am certain that you enjoyed making this one. Gee it bought you had changed the layout in the photos but realised I was looking at it differently. Stunning. The presence of that neat spider made me purchase some of that material... Thanks, Rita!!! Love love love this! I've never seen a log cabin quilt made like this. The light colors almost look like circles with indigo four point stars. Beautiful! 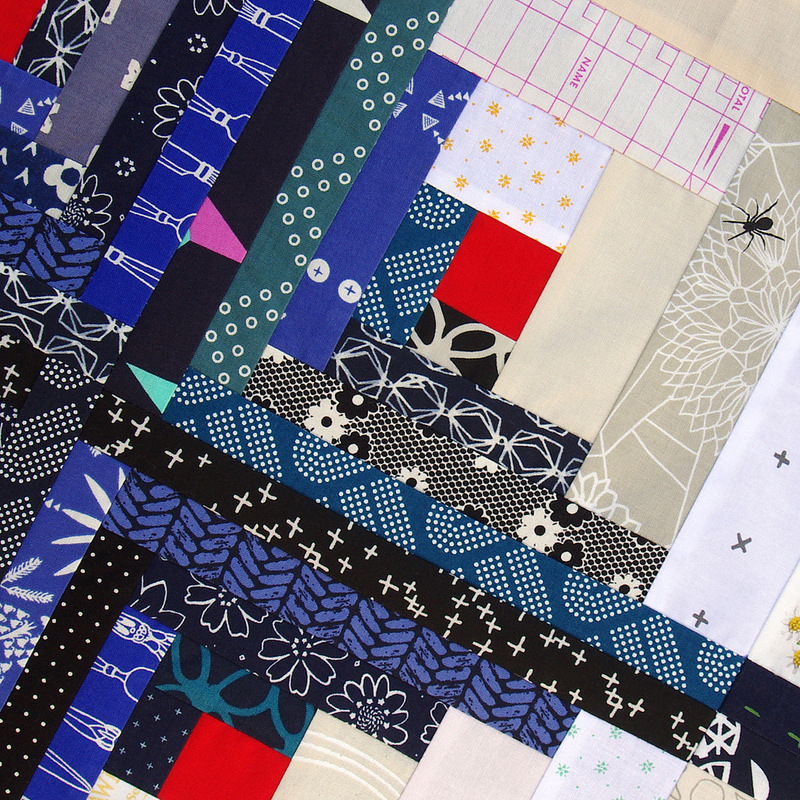 Makes me (almost) want to make a log cabin quilt. It's just beautiful! I have never made a log cabin type quilt. I wonder what it would look like with the colors switched? Beautiful work!